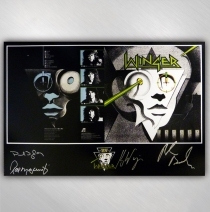 To commemorate Winger's 25th Anniversary, artist Dan Hubp has created this limited edition first album Commemorative Prints. Dan is the man responsible for creating Winger's s/t album artwork. Only 100 prints will be made and each will be personally hand signed by the original Winger line up, Kip Winger, Reb Beach, Rod Morgenstein & Paul Taylor. 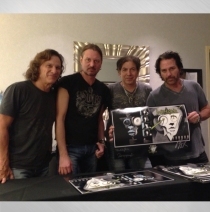 Each beautiful print measures 16x24 and is printed on high quality Kodak Professional Lustre paper. Dan Hubp is a four-time Emmy nominated and two-time Emmy Award winning production designer whose distinctive designs span a variety of work, from music videos to television to the touring sets for Winger to last year's staging of the 'John Cage Songbooks' for the San Francisco Symphony at Carnegie Hall. PLEASE MAKE NOTE: These prints have been handled personally, by the band, and there is the possibility of slight imperfections around the edges.